I am very excited to write about something amazing that is going on right in our Verdugo Woodlands neighborhood! 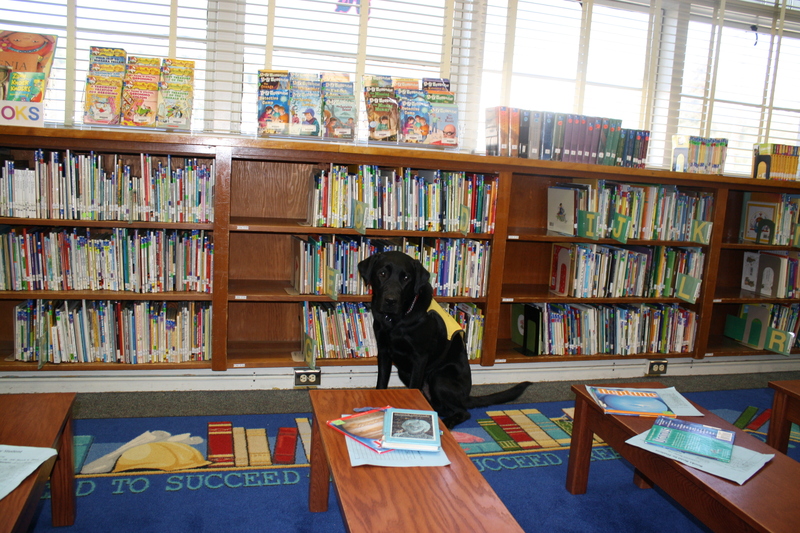 Did you know that there is a little guide dog in training that lives on Woodland Avenue and attends Verdugo Woodlands Elementary? It’s true. Sheila Abranian has been a 3rd grade teacher at Verdugo Woodlands for the past 17 years and she began raising and training guide dogs 2 ½ years ago. I recently spoke to Sheila at length about guide dogs in training and would love to share with you what I learned. What is Guide Dogs of America? Guide Dogs of America is a non-profit organization whose mission is “to provide guide dogs and instruction in their use, free of charge, to blind and visually-impaired men and women from the United States and Canada so that they may continue to pursue their goals with increased mobility and independence,” www.guidedogsofamerica.org. The organization was established in 1948 and the closest location is in Sylmar, California. Guide Dogs has three main programs: a breeding program, a puppy raising program and a guide dog program. Sheila became a puppy raiser in 2009. The puppies are placed in foster homes when they are about 8 weeks old. It is a bonus if the foster family has children and/or other pets. Guide Dogs pays for all veterinary bills while in the foster homes, but the family pays for the food, treats, toys and other supplies. It is the role of the puppy raiser to socialize the puppy as much as possible, which often means lots of outings. “A well socialized puppy will have fewer adjustments to make when it comes in for formal guide dog training,” according to Guide Dogs of America. Then the puppy returns to Guide Dogs for formal guide dog training at about 18 months old. The formal training last about 6 months and then, if the dog qualifies, he is paired with a blind or visually-impaired person. Sheila fell in love with Labradors when she first met one through a friend. She owned two Labs and when they passed away she decided to become a guide dog puppy raiser. She got the idea from a bumper sticker that read “Raise a guide dog and make a difference”. 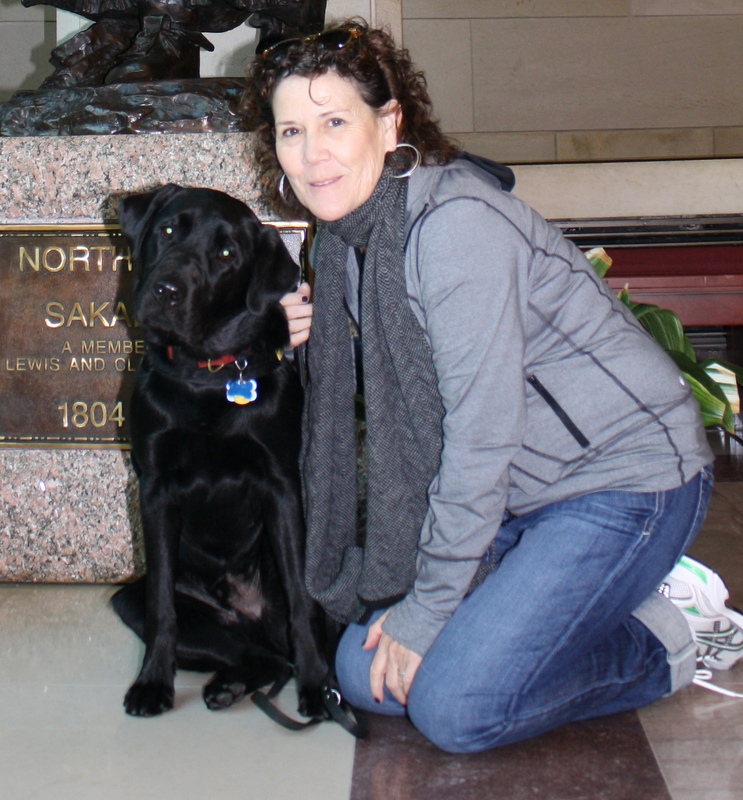 Sheila wanted to volunteer and she is passionate about dogs, so Guide Dogs of America was a perfect fit. She submitted an application and 9 months later took home a little, 7-week-old yellow Lab named Fergie. She explained that Guide Dogs asks for an application and does a home visit to ensure that the potential puppy raiser is fit for the job. They want to make sure that the puppy raiser will be able to train the puppy, can spend a lot of time with it (including taking the puppy to work) and can commit to monthly training sessions at the Guide Dog campus. Guide Dogs is in favor of the puppy raiser having other pets in the home. It is good to have birds, cats and other dogs so that the puppy is exposed to other animals and will not be distracted by them later in life when they are working dogs. Sheila’s adult daughter co-raises the puppies with Sheila and Guide Dogs encourages such partnerships in the training process. The primary job of a puppy raiser is to take the puppy to as many places as possible in order to expose them to the world that they will eventually be working in. Sheila brought her puppy in training to work with her as a teacher. Little Fergie puppy was very popular on the campus of Verdugo Woodlands Elementary as she grew and continued in her training. Fergie continued to grow and train but when she started her final testing they discovered a non-life threatening respiratory issue that did not allow her to become a guide dog. Guide dogs are working dogs and need to be in top physical health. When this happens they call it a “career change”. Now Fergie resides with Sheila as her pet. Sheila still had the strong desire to help blind people and so she applied for another puppy and took a 7-week-old, black Lab named Walter home in January of 2011. 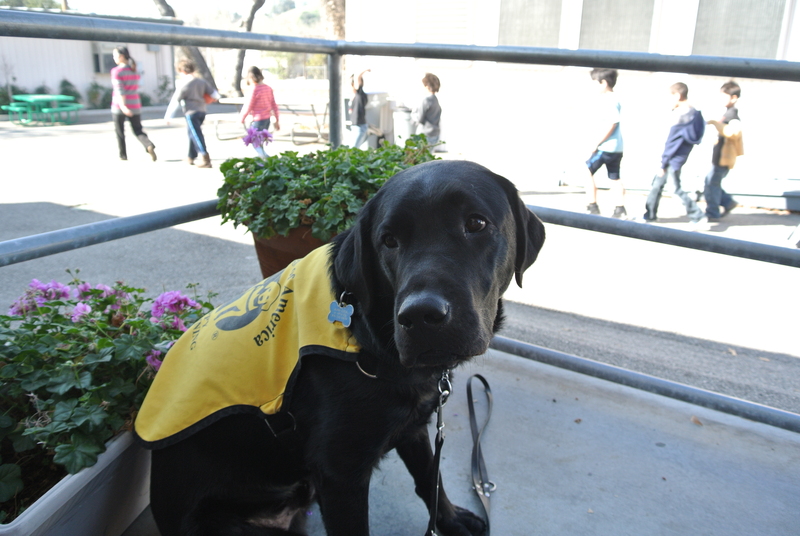 Sheila has the full support of the school and district to bring Walter to her work at Verdugo Woodlands Elementary. He goes to work with her about 3 days a week. He is often seen in the computer lab, classrooms, the playground and the hallways of the school. He is a very popular “student”. He is also seen at many of the school events such as awards banquets, the fundraising gala, assemblies, etc. Sheila sent home letters to all of her students’ parents to ask for permission and possible allergies prior to bringing Walter to school. She said that all of the permission slips were returned the next day! Everyone seems to love having Walter on campus. He has a dog crate in her classroom but is so well-behaved that he is often seen lying under the table in the back of the class. Sheila has the children read to Walter and now that he is older they are allowed to pet him after class. People, myself included, often ask if they can pet a guide puppy in training. Sheila explained that it is O.K. to pet the puppy if they are sitting nicely but if the puppy gets too excited and jumps around they have to be taught to be calm. I think that Sheila is setting an amazing example for her students. She is teaching them the importance of volunteering and eventually giving up a pet that you love dearly in order to help a visually-impaired person. In addition to attending school with Sheila, Walter goes on regular outings in the Glendale area. He enjoys going to coffee, the movies, restaurants, grocery stores, on public buses and has even flown on airplanes. He recently traveled to Washington D.C. and back. When Sheila was called to report for jury duty this year, Walter went too. All of the people in court fell in love with the puppy in training! I was interested to learn that the laws pertaining to guide dogs and puppies in training differs by state. 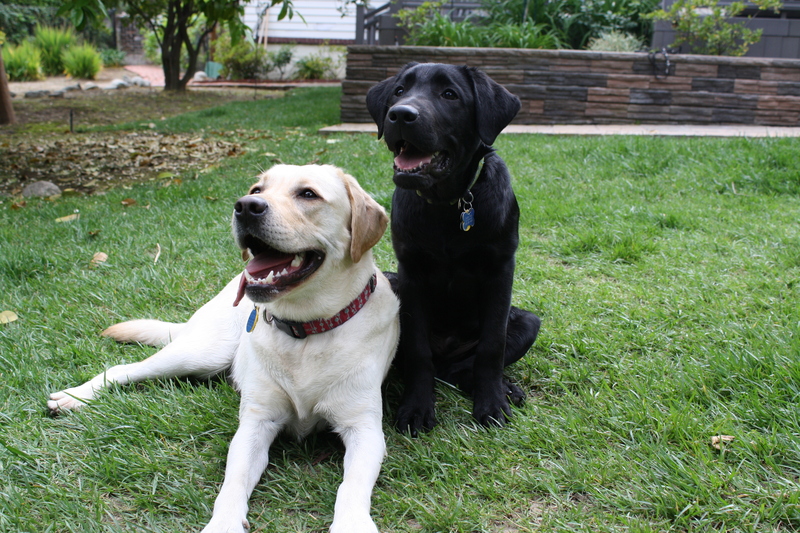 In California, guide puppies in training do not have to be allowed in all public places like guide dogs. In order to qualify for needing a guide dog you need to be legally blind, so this also includes people who have some vision left or are partially blind. Sheila reported that all places allow them access once they see the “guide puppy in training” jacket on Walter. Walter has many friends all over town. Sheila has been overwhelmed by how positively people react to the puppies in training. Sheila said that the Trader Joes in Montrose is especially fond of Walter, and he is offered a latte at his local coffee shop (of course he declines). 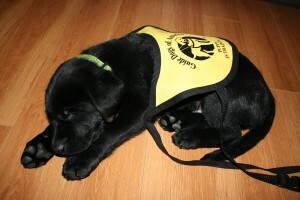 Who can resist an adorable black Lab puppy with a yellow “guide puppy in training” jacket? Walter is allowed to be a regular Lab puppy once his training jacket is off at home. He loves to play fetch, play with his sister, Fergie, and jump around the house. He knows that he is no longer in training once that jacket comes off and knowing that distiction will make a great working dog someday. Guide dogs need to relax, have fun and play when they are not working and helping their owner. Sheila feels that Walter has the qualities that make a great guide dog. He seems to want to have a job and purpose, Sheila said, and seems happiest is doing something. Not only does Walter have friends all over town but he also has a Facebook page that he shares with his dog sister, Fergie. On Facebook they currently have over 297 followers or “friends”. Sheila established a Facebook page for Fergie in order to connect with other guide puppy raisers and it grew from there. Walter and Fergie post about their outings, photos, and comments. It must be tough to type with paws! Sheila is often asked, “how can you give up your dog?” She explained, “I am raising my dog for a friend that I haven’t met yet”. She feels that this statement puts everything into perspective. That “friend” could easily be a family member, friend or someone else that you would want to help. On a recent trip with Walter, Sheila was stopped by a sight-impaired stranger who thanked her for all that she is doing to help blind people. She bonded with this lady and spoke for 30 minutes about the amazing difference working dogs make in the lives of blind individuals. Sheila spoke about attending the guide puppy graduation where the puppy raiser gets to meet the new, owner of the puppy. She said that she is filled with joy to see how well the puppy responds to all of the consistent training and in turn changes a life by helping a blind person. Sheila hopes that Walter will be a part of his graduating class and although she knows that she will shed tears of sadness in saying goodbye, she will also shed tears of happiness for the person that really needs Walter. Guide Dogs of America desperately needs more puppy raisers like Sheila. If you are interested in becoming a puppy raiser, please contact Guide Dogs of America. The organization is 100% funded by donations only and they do not receive any state or federal funding. Please go to their website and you can hit the “make a donation” box and donate right there. Your donation will help them provide a guide dog to a blind individual free of charge. “Help make a difference in the life of a blind individual in the form of a loving, four-pawed partner today”, www.guidedogsofamerica.org. We wish Walter the best of luck with his continued training and testing and we thank Sheila Abranian for her amazing sacrifice of time and love with these amazing puppies. 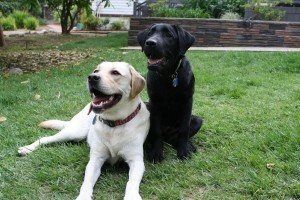 Look for a black Lab named Walter (wearing a yellow jacket) as you are out and about in Glendale. The gift of your time can be the greatest gift for someone in need! Thanks Sheila for being so gracious with yours!